Small Irish pub in Hackney. 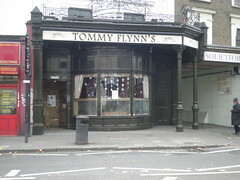 As of late-2013, it has been renamed as Tommy Flynn's from its former name of the Wishing Well photo. The comments below pre-date the change of name. Kake et al. visited in September 2010 as part of the 38 bus route pub crawl. There was no real ale, so instead we variously had Guinness Extra Cold, John Smith's Extra Smooth, keg Courage Best, and Strongbow. A TV was showing Gaelic football with the sound on, though Irish music was playing in the background too. Service was very friendly, with the landlord apologising for not being able to serve the Courage Best in an actual Courage glass. There's a small smoking area out the back. Last visited by the 38 bus route pub crawl, September 2010. Last edited 2013-12-06 15:23:28 (version 6; diff). List all versions. Page last edited 2013-12-06 15:23:28 (version 6).